We just finished painting our bedroom last night (finally! ), so now I can start decorating!! I'm sticking with the same color scheme I already had because I've been so happy with it, but what I need next is a headboard. 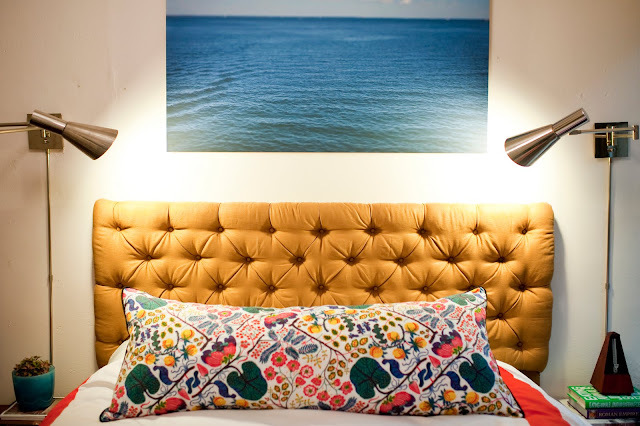 I've never been a big fan of headboards, but I do think they complete the look of the room. Now that we're not planning on moving again, I feel like it's time to settle on one. When Joanna Goddard posted their bedroom makeover, I fell in love with their new headboard! Isn't is so pretty?! Since I've finally found one that I really like, I've been leaning towards something similar for our room. This one is similar, and it's a DIY that supposedly only costs $20! I like the sounds of that, but I'm not the best at manipulating large pieces of material and transforming them into something that actually looks good. This is another DIY that only takes five hours but I noticed in the directions there's a needle and thread aaand I don't know how to sew. Maybe this can be a project my sister or mom could help me with if I decide on this one. I also like this one. I can't decide if I like the scalloped look on the top or just straight across. This one from West Elm is straight across, but I don't know if I like how high up the wall it comes. It's a maybe. I could lose the tufted headboards altogether and just get a plain scalloped headboard. I've always preferred simple but I'm kind of into the tufted look. Which one do you like best? What kind of headboard do you have? I love this idea for a headboard. Joanna's yellow/gold headboard is my favorite. Nice color to brighten up the room and perfect length and size. I don't have a headboard because my bedroom is way too small and cramped to accommodate one, but I dream of the day when we get a bigger place so I can decorate the bedroom as I please! I like the 2nd and 3rd ones, I think because they seem to have fewer little buttons on them. Ans I also like the last one, it's simple but makes a statement! I love that one that Joanna has. So pretty! :) Don't like the ones that come so high up on the wall. Tough decision....I like all of them but 2,3, & 4 are at the top of my list. I'd love to have a prettier headboard. Right now we are stuck with the store bought wood frames that came with our bed. The hubby probably wouldn't understand why I want to get rid of a perfectly good frame...LOL Have fun decorating! That is the fun part! I LOVE upholstered headboards!! One day I'm going to get rid of my wooden one and DIY one of these, with nail head trim. I would totally be up for helping you knock out this project! Put it on the list for sometime this summer, and I'll come up for a weekend. Caleb can watch the kids (ha!) and you and I can get it done! I think I like the 2nd and 3rd one best...fabric headboards are nice...wish I had one! I think the tufted ones are pretty awesome, but I surely wouldn't trust myself to DIY. No thank you!! We have a more traditional wood one in our bedroom - part of a set with the dresser and nightstands. Boring! Are you going to make your own? I have a friend who made hers and it turned out beautiful! i'm kinda feeling the tufted look, too. i love them all but i think my favorite is the DIY that takes five hours - so pretty. can't wait to see how yours turns out! I actually brought some fabric and some foam to make a headboard and then never got around to it. My mother-in-law found a beautiful bed that is cherry wood for us second hand and that is what we are still using. i LOVE Joanna's room makeover!! Wish I could make ours look identical. Can't wait to see what your room ends up looking like! PS your house is BEAUTIFUL!!! So I'm catching up on your posts from while I was gone... I like 2 and 5 the best. Can't wait to see what you decide on and how it turns out.